Our Manager “Gennah”side by side with Marcia is our Team Leader. Gennah is Australia’s and Bailey’s best Import from the UK! Gennah has helped Baileys to gain the reputation for which it is known today. 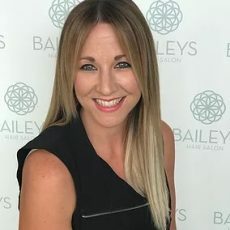 Gennah loves all aspects of hairdressing but most of all loves the interaction with her clients and making them look and feel amazing. Expect The Highest Quality Of Care!